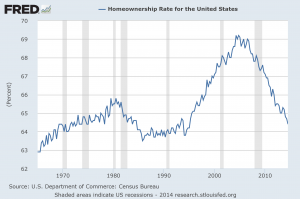 Navigation: Home » Economics » How Has Real Estate Performed Since the Recession? How Has Real Estate Performed Since the Recession? In a word? Not so hotly. Of course, prices have rebounded quite a bit since the Great Recession, but a few indicators clearly show that things still have quite a way to go – if we assume they are snapping back to where they were even in the early 2000s. This data all comes from Tuesday’s Census Bureau release of the most recent 3rd Quarter of 2014 data on homeownership… and they paint a pretty interesting picture, at least when it comes to claims of a solid recovery. 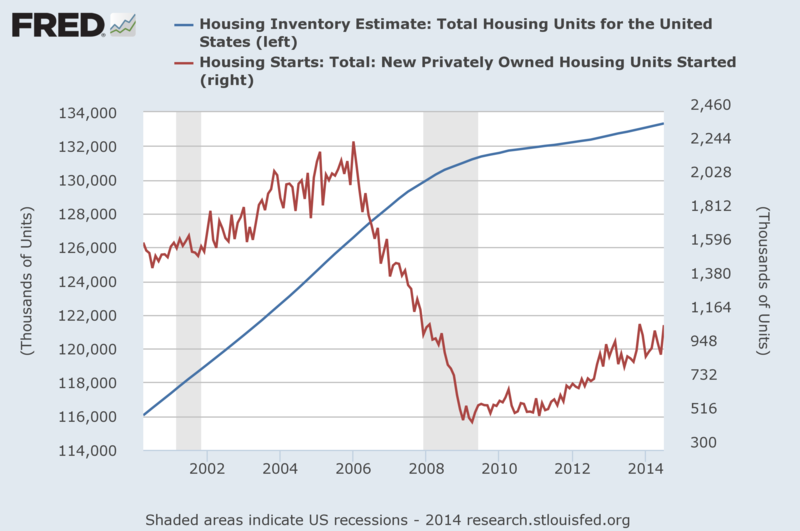 If recovery needs a real estate echo-boom, these charts show that we have a lot left to run. A lot of the issue (and we were told, constantly!) of the real estate market pre-recession was the rapid increase in inventory. In just 8 years, the housing stock increased by over 10%. Since then? We’ve leveled out a bit. So, what do you think? Do we need a real estate echo boom for a durable recovery? What’s the proper homeownership rate? Anything else you’d like to see? 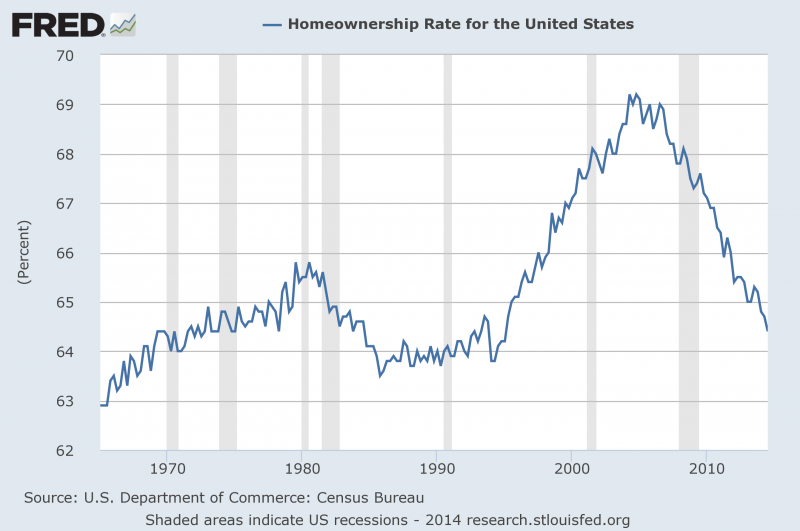 The other thought that comes to mind is why is the homeownership rate so important? Basically, everybody has to live somewhere (except the homeless) so the economy has to build either rental units or houses. 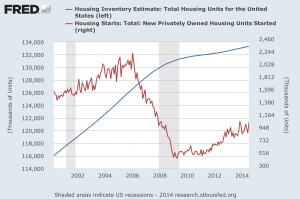 Why don’t rental unit new starts factor in just as much as housing starts? Finally, what would it take to get people to buy more homes? Remember what got us into trouble in the Great Recession? It was too much debt with minimal downpayment to people with poor credit. Do we really want to start that cycle all over again? Apparently a lot of idiots in Congress do. Skip, thanks for your comment. I’ll hunt around for the homeownership rate – maybe that data is somewhere (maybe in the appendix for some Econ study), but all I could find simply was through the mid-1960s. And yes, of course, rental units matter too – the release came with a number of rental statistics as well (vacancies and the like). For various reasons, however, housing stock is higher quality and more stimulative than rental units – housing inventory is usually higher quality, homeowners upgrade their interiors more, there are community effects when neighbors stick around, etc, etc. I see 5% upside to getting homeownership back to 69-70%! I think thinks will be pretty flat for the next several years………… well, maybe not with AirBnB and UBER going public soon. Any thoughts on when Millennials will leave the proverbial basement (that statement carries loads of East Coast bias – who has basements over here) and buy their own homes? I think it will be a slow process, especially since Millenials are not buying homes. The statistics are low and we are depending on older people to make this investment. They might be reluctant after experiencing losses during the recession. Hopefully people will realize the benefits of owning their own property and take the risk.